No one can give you Enlightenment. Only you can give that to yourself. In most external ways I am no different from the billions of people who share the earth today. 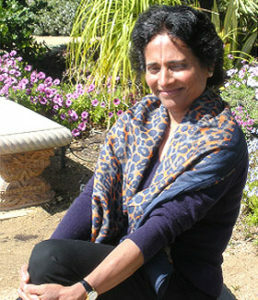 I was 14 when I left India and made US my permanent residence. Although I spent most of my years in the States, my Eastern cultural roots have remained well established. After completing all my studies I worked many years with various pharmaceutical companies and other medical industries, married, and raised a family while leading a normal life. I traveled extensively with my husband and two daughters, lived overseas for several years in Costa Rica, Venezuela, and Nigeria, and visited India only occasionally in the ensuing years. My book “Home at Last” explains in detail my experience of Self-realization, which was not something I had preplanned or researched and worked on for years before it occurred. Instead, I felt as though it was preordained and was in a sense imposed on me; a journey meant to be completed because it was my time to pursue it. The book explains how I reached that state without relinquishing the life I was given; having a family, a career, and an active social life with all the responsibilities inherent in those roles. Thank you, Eternal Oxymoron, for your wonderful review! Read the entire review. Download an excerpt of Home at Last! I would love to come and talk to you! One of my favorite things is to talk to people who are ready to embark on their experience of en1lightenment—or even who are just curious. If you would like me to come speak to your group, please contact me! Join my mailing list and get insight and information delivered right to your inbox! I highly recommend "Home At Last" as Chiruvolu has succeeded admirably. In common language, she explicates what is inexplicable—the "not this, not that" of what we label reality. She even alludes to what contemporary quantum physics is revealing about what the ancients long ago subscripted. Sarada Chiruvolu takes us into a powerful journey of self-discovery and realization. From meeting with her Guru, to her many pilgrimages to the spiritual centers of India to her deep devotion in exploring the higher realms of consciousness, this book is a wonderful inspiration to those who are interested in finding the deep core of inner peace and consciousness. 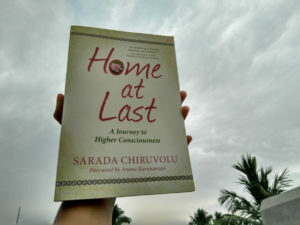 Sarada Chiruvulo's new book brilliantly takes the reader on a profound journey on the road toward enlightenment. In sharing her personal spiritual experiences in a very clear and lucid style....Sarada lights the way for us to walk the mystical path with practical feet. "Home at Last" invites us to dive deep and explore the divine waters of the ocean of bliss with Sarada as our trusted guide! If you are unwaveringly inclined toward spiritual discovery, especially while grounded in a “normal” family, work, and social life, you will find "Home at Last" an outpouring of wisdom, education, and guidance. 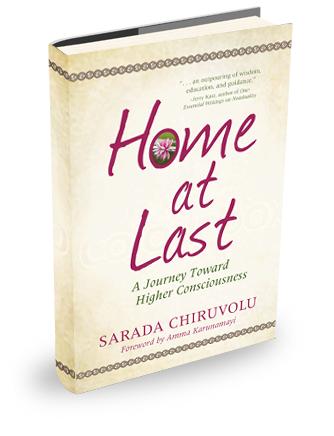 Sarada Chiruvolu reveals her journey in a caring, practical way that is truthfully spoken. It is “A rare and courageous account of the Journey Inward” – the ultimate journey and goal of all mortals, regardless of ones (spiritual) affiliation. "The wide range of experiences the author shares in these excerpts creates a compelling introduction to the story of a dedicated spiritual aspirant. I look forward to reading the whole book as it promises to offer an unusual level of exposure to a rich inner journey." "Home At Last" can serve as inspiration and guidance to meditators and to those who have been discouraged with their efforts to meditate. This book tells the story of one woman's journey to that goal and the three chapters presented on the website give us a tantalizing glimpse into that journey and a desire to see the rest of the book. Help me spread the word! Follow me!